Here is the completed set of the wedding invitations, favor boxes and RSVP cards and envelopes. I made for my friend's wedding. 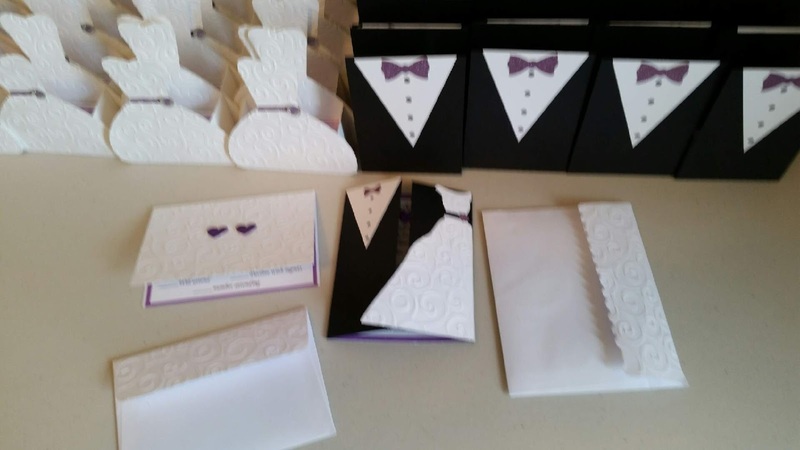 I used the cuttlebug swirl embossing folder on the bride and groom favor boxes see video here. and on the envelop flaps of the invitations and RSVP reply envelopes. 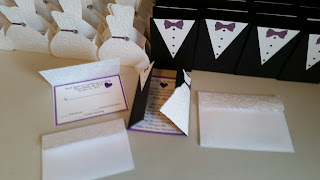 I used a small heart punch on glitter purple paper for the invitation and inner envelop of the RSVP card. I was glad to say that the envelopes and cards survived their postal journeys. Thanks for sharing this creative journey with me. Please subscribe to my YouTube channel here for more video's and follow me along here for more 3D designs. Thanks for stopping by today and leaving your comments. I love hearing from you. Have a happy crafty day. They are gorgeous. Thank you for joining us at Crafty Girls Creations challenge. Pretty prettty cards there!! :) Thank you for joining Craft for the craic.